Is John McAfee crazy or is the anti-virus pioneer just pulling off his greatest publicity stunt yet? Or is he just pulling off his greatest publicity stunt yet? Photo by Johan Ordoñez/AFP/Getty Images. From the moment antivirus pioneer John McAfee went on the lam from Belize authorities three weeks ago, the basic question hanging over the story was: Is John McAfee crazy? McAfee didn’t slip out of sight, however. He undertook what has become perhaps the best documented disappearance in human history. He started, on his second day in hiding, by directly phoning the media—first to Joshua Davis of Wired, then to a handful of others, and by the end of the first week to seemingly anyone who would take his call. He started Tweeting, and then he started a blog. He invited journalists to interview him in hiding. Then invited two reporters from Vice magazine to tag along. Obviously, calling attention to yourself is the opposite of a rational strategy for someone on the lam. The first rule for anyone accused of any crime, anywhere, is: Shut up. Get a lawyer. Let someone else do your talking for you. Getting the hell out of dodge is another obvious, rational strategy. Why not return home, back to the United States? The United States has an extradition treaty with Belize, but it’s aimed at drug dealers, and its primary intent is to move people the other way, from Belize back to the States. But instead of heading home (where, admittedly, he faces a number of legal woes, including a wrongful death lawsuit, among others), McAfee apparently lingered in Belize for weeks, criticizing the country’s government and police with colorful vehemence. Doubts about McAfee’s sanity have also been fueled by the nature of the stories that he’s told. In his first conversation with Wired’s Davis, for instance, he said that he had eluded police by burying himself in the sand and covering his head with a cardboard box. Later he said that he’d been lingering in the vicinity of his home in a variety of disguises, accosting journalists and screaming obscenities without being recognized. He has been especially operatic in his description of what he describes as a sustained, nefarious plot of the Belizean authorities to exterminate him—even though he has in fact enjoyed a quite close relationship with the local police. Indeed, he posed with police officials at a press conference just days before Faull’s murder, on the occasion of McAfee’s donation of a considerable quantity of stun guns and other material to the force. 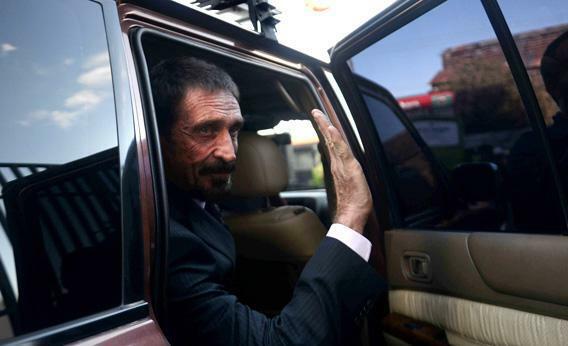 Ultimately, it was McAfee’s hunger for media attention that brought his escapade to an end. This past Monday the journalists tagging along with him from Vice accidentally revealed his location in Guatemala by publishing a picture with embedded location data. McAfee first claimed that he’d deliberately forged the metadata to fool pursuers, then admitted that they’d screwed up, and soon after appeared before a throng of reporters in Guatemala City announcing that he would seek asylum and hold a press conference. But he didn’t get a chance: On Wednesday night Guatemalan police took him into custody and announced that they would soon deport him to Belize. Assuming they do, the million-dollar question is: Will Belize finally charge him, or let him go? Under Belizean law, the police can hold a person for questioning for up to 48 hours without placing him or her under arrest. What they choose to do will depend on how much evidence they have against him. If McAfee is innocent, or took some basic precautions in the execution of the crime, there will be little physical evidence against him. Here’s where the question of sanity becomes particularly germane. No one questions that McAfee is fiercely intelligent; while reporting on McAfee I have twice stayed at his home as his guest on multiday visits and I can attest to the keenness of his intellect. But by all evidence he has spent the last several years heavily using the potent psychosis-inducing drugs known as “bath salts.” If he did kill Faull in the throes of an intense high, would he have had the presence of mind to erase his tracks? If McAfee’s goal over the last three weeks has been the reasonable one of staying out of prison, then, his strategy could reasonably be described as crazy. It’s possible, though, that his strategy has actually been a very reasonable one, but in service of a crazy goal: that is, to generate as much media attention as possible. (Why anyone should crave attention so badly is perhaps the most impenetrable mystery of all.) If that was his goal, his performance has been simply masterful. Understanding the dynamics of the news cycle, he carefully husbanded his material, first doling out small, bland exclusives to one reporter, then gradually opening up the field to more and more journalists, amping up the volume and the outrageousness of the stories to ensure that the headlines kept coming. As long as he was in hiding, he had total control over the fuel that drives all media coverage: novel, interesting information. Ultimately, however, the goals of freedom and attention-luring are not compatible. Some have expressed surprise that, upon being taken into custody by Guatemalan police, he was immediately given access to a laptop and allowed to continue blogging at will. It’s not remarkable if one considers that the police must be quietly delighted at McAfee’s logorrhea. For all the bizarre plot twists McAfee has engineered since Gregory Faull’s death, it appears that his capture in Guatemala was not one that he planned or particularly relishes. In the tape that Vice magazine posted of his arrest Wednesday night, McAfee can be heard saying to his lawyer: “Can they take me back to Belize tonight? Are you sure, can you promise me, sir? Because I’m not worried about anything else.” Today, Guatemala announced that it would not grant him asylum and intended to send him back to Belize. The stress and alarm caused by his detention no doubt went a long way toward triggering the reported heart attack that Thursday afternoon sent McAfee to a hospital in Guatemala City. Whatever happens next, it will not transpire as a result of McAfee’s inventive imagination. Nor will McAfee’s voice be the sole source for the remainder of the tale. From now on, the story enters a new phase, one grounded in the reality of concrete, iron, and evidence, and if John McAfee is crazy, it will eventually become clear exactly what kind of crazy he is.